Look at your laser printer. Nice, right? Expensive, too. That machine keeps your office humming. Reports, memos…even pictures of your kid’s dance recital. Where would you be without it? Your laser printer in the linchpin of your busy office, but it harbors a dark secret and a hidden agenda. It doesn’t just want to print your projects—it wants to bleed your wallet dry. Here’s a cold, hard fact—your laser printer is basically worthless. No matter how much you paid for your laser printer, the manufacturer didn’t make a large profit from the sale. The big money is made on genuine OEM toner. The companies that make laser printers want to put a toner eater in your home or office. Printers are practically “free to a good home” as long as you promise to feed and care for it. That’s where the makers of laser printers make their most profit. Printer manufacturers—HP, Epson, Brother, etc.—profit most from selling you OEM toner and supplies, a commitment that lasts for the life of the printer. 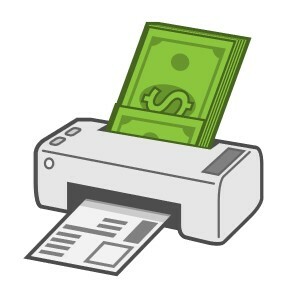 In some cases, replacing the toner cartridges costs more than the actual printer itself! Manufacturers are constantly try to squeeze more money out of you and your printer, year after year. From reducing the amount of toner packed into cartridges, to decreasing the lifespan of parts, printer manufacturers are forever on the lookout for ways to increase your cost-per-page. The ugly truth is that your printer is an ATM, printing money for the manufacturer every time you replace the toner or ink. The only way to break the cycle is to find a reliable third party source for your printing supplies. Toner Buzz is an independent dealer, not directly affiliated with any manufacturer, which frees it from the price restrictions imposed on other printing supply retailers. FREE ground shipping, a vast product selection, and award-winning customer service makes Toner Buzz the number one online seller of OEM toners, inks, fuser kits, drums and maintenance kits in the world.